All week the discussion around the track of hurricane Joaquin has been about the uncertainty. Today the end game for Joaquin is much more certain as Joaquin has now started its northward movement away from the Bahamas where Joaquin grew to an impressive category 4 hurricane. Joaquin is the first category 4 hurricane to hit the Bahamas in October in 149 years (1866) and should easily cause billions in economic loss for the country. The latest NHC advisory shows Joaquin gaining a bit of latitude, and most forecast model guidance now show that Joaquin will track northeastward away from the U.S. East Coast. There is only a small probability Joaquin will make U.S. landfall, and the NHC cone of uncertainty no longer touches the U.S. coastline. Nantucket, MA, has the highest probability of impact at 14%, with other northeast cities at a lower percentage. Overall, by Monday, Oct 8, Joaquin should be tracking between the U.S. northeast coastline and Bermuda as a weakening hurricane. It should be noted, however, that there is still a possibility that Joaquin could be captured by the coastal nor’easter moving up the coastline this weekend, which could pull Joaquin into New England. But again, the probability of that scenario is low. There still remains a high flood threat along the East coast as Joaquin funnels tropical moisture northward. Rainfall totals will continue to increase across much of the East Coast with the potential that some locations could experience more than five inches of rain by the end of the weekend with a large part of South Carolina forecasted to experience 10+ inches of rain. NOAA quantitative precipitation forecast 3 Day Forecast Rainfall amounts. Minor coastal flooding is already occurring along the East Coast due to strong onshore winds being sandwiched between Joaquin to the south and strong Canadian high pressure to the north. That flooding will likely worsen over the next few days, regardless of the track of Joaquin. Joaquin has generated more Accumulated Cyclone Energy (ACE ) in 3 days than all other Atlantic storms during the month of September. Joaquin might have been a bit of a surprise given all the talk that this season is an El Niño year and overall activity should be lower than normal. However, Joaquin did not originate in the deep tropics off the coast of Africa where El Niño has its greatest influence. Instead, El Niño had very little influence on Joaquin because of the location of its origin. Joaquin formed at 27.5 degree north latitude and moved southwestward toward the Bahamas where it was able to feed off the very warm waters of the Bahamas. With 59 days left in the Atlantic hurricane season, we need to watch for more storms like Joaquin that form without El Niño’s calming influence. There is very warm water off the East Coast which will continue to cause headaches for the insurance industry right through the winter. These warm waters can strengthen tropical systems like Joaquin and/or stronger nor’easters like we are seeing this weekend. Historical climatology data suggests typical October tropical cyclone development should occur in the western Caribbean, but given the hostile conditions in the deep tropics due to high wind shear from El Niño, the development will likely be closer to the U.S. Coastline and into the Gulf of Mexico. The quote above is often ridiculed, but it’s actually a brilliant description of Joaquin. In fact. the insurance and reinsurance industry are all too familiar with knowns and unknowns. Model uncertainty is part of doing business, and it is common knowledge that all catastrophe models have some degree of unknown error. There has been a push by insurance companies to funnel better location-level data into the catastrophe models in an effort to limit the overall model uncertainty in modeling risk at a location level. Weather models are similar to catastrophe models in terms of uncertainty: uncertainties exist in every model run; but generally, the more detailed the input, the greater the accuracy of the output. Better input helps limit uncertainties. Already this year we anxiously awaited the arrival of a Tropical Storm Erika as a catastrophic hurricane to impact Florida hurricane, only to watch Erika fizzle a couple hundred miles south of Cuba. I have highlighted the overall uncertainty in Joaquin’s forecast track all week. As anticipated, we have already seen the model and official forecast for Joaquin change drastically from east to west to back east. Most arm chair meteorologist are unaware that behind the scenes increasing amounts of data detail are feeding the weather models to try to get a better picture of the overall atmosphere. Extra weather balloons are being launched at sites all over the Eastern U.S and Caribbean. NOAA and the U.S. Air Force have multiple aircraft sampling the environment in and around Joaquin. All this data is being fed into the weather model to hopefully limit overall uncertainty: just like in a catastrophe model. Ironically, with more detailed input, the overall forecast for Joaquin has become more certain, but yet the overall track options for Joaquin extend past the National Hurricane Center’s (NHC) cone of uncertainty in this case. In my opinion, Bermuda, which is not even in the cone of uncertainty, is just as likely as Boston to feel Joaquin’s impact. In the short term, Joaquin will significantly impact the islands of the Bahamas as Joaquin will fluctuate in intensity as a major hurricane for the next 24 – 36 hours. As mentioned yesterday, after 36 hours the door is wide open for several different track paths. A U.S. landfall is still possible, but the new forecast models (that are being fed all this higher resolution data) suggest a more eastward shift in track away from a U.S. landfall. I consider the ECMWF model (image below -Right) to be very good and reliable, and it illustrates Joaquin moving out to sea and closer to Bermuda. I expect by Friday we will have a much clearer picture of where Joaquin will track this weekend, and with that, insured impacts can start to be calculated. American (GFS Model) left and the European (ECMWF Model) right ensemble runs which in total is over 75 separate model runs of possible tracks for hurricane Joaquin. As Joaquin funnels tropical moisture northward, rainfall totals will continue to increase across much of the East Coast regardless of whether the hurricane hits land. Over a foot of rain could occur in some area which will produce flash flooding. Hurricane Joaquin rapidly intensified overnight and is now a Category 1 hurricane tracking west toward the Bahamas. As I wrote about yesterday, the forecast uncertainty for Joaquin is extremely high. The National Hurricane Center (NHC) has clearly communicated this uncertainty in their forecast discussions which I have quote below. Although uncertainties exist, I think it is safe to warn about what the known impacts will be “IF” Joaquin approaches or makes landfall along the East Coast. We do know that hurricane Joaquin is now located 215 miles east-northeast of the Central Bahamas and will continue to strengthen into what will likely be a major hurricane off the East Coast by Saturday. In fact, water temperatures near Joaquin are currently at all-time record warm levels and could, if all other factors align, easily support a Category 5 hurricane. In fact, a high-end Category 3 or 4 is now likely for Joaquin, which would pack sustained winds of more than 120 mph over the Bahamas. However, it should be noted that regardless of the hurricane’s strength over the Bahamas, as hurricanes move northward out of the deep tropics, climatology suggests they tend to weaken and speeds up. How much Joaquin could weaken is still unknown. 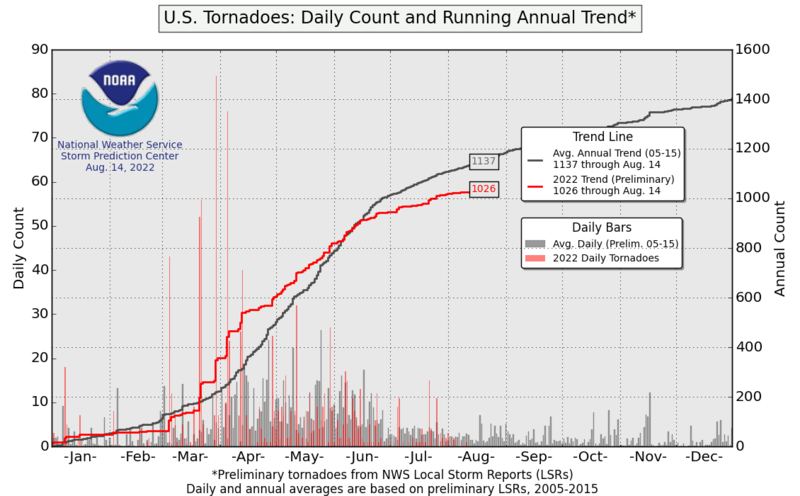 Therefore it is still premature to estimate a landfall location and insured impacts along the East Coast. Regardless of storm strength, as an East Coast hurricane, Joaquin will create large waves, and the stronger the hurricane, the larger the waves will be. In this case, a constant on shore flow will cause extensive beach erosion along the coastline and impact coast properties. Depending on the final track and if Joaquin makes landfall, a large storm surge will likely accompany Joaquin. In fact, the devastating current possibility that Joaquin could track up the Chesapeake or Delaware Bays can’t be ruled out. This type of storm track has been modeled to produce devastating storm surge for these coastal bay waters, and the already high water levels from rainfall and a near super moon will not help the situation. In addition to the torrential rainfall currently impacting much of the East Coast, some models are forecasting more rain depending on Joaquin’s forecast track. Some forecast models produce an additional 8 – 10” of rain on top of saturated ground. And with already high river levels, some major river flooding can be expected. In summary, the uncertainty in the current track forecast cannot be understated, and it is not even represented well by the official track forecast by the NHC. Unfortunately in this situation, the spread in the forecast models is far greater in size than the cone of uncertainty in the official forecast by the NHC. As the image below shows there are still several models including the very good and reliable ECMWF (not shown) that take Joaquin out to sea. I expect by Friday we will have a much clearer picture of where Joaquin will track this weekend, and with that, insured impacts can start to be calculated. GFS Ensemble model shows 2 distinct solution clusters for storm tracks Door #1 up the east coast. Door #2 out to sea. As you might have noticed TS Joaquin has been named by the NHC and is currently 425 miles East Northeast of the Bahamas. I have been saying since the start of the season the main threat this year is along the East Coast of the U.S which follows the pattern over the last several years. Joaquin is forecasted to move closer to the East Coast this week and with it is the threat of a tropical system impacting the East Coast of the U.S. Though the forecast remains very uncertain, heavy rain, coastal flooding and strong winds are possible for the Mid-Atlantic and Northeast starting Friday with upwards of 12” of rain are forecasted to fall by the end of this weekend regardless of the strength of Joaquin. Though it’s too soon to tell exactly where the storm will head and how strong it will get by the weekend, the possibility remains that Tropical Storm Joaquin could become a weak to major hurricane just off the Eastern Seaboard on Saturday morning. Much like we saw with TS Erika earlier this year the forecast models are handling this storm poorly and there is extremely low confidence in the forecast at this given time. Above is view of the very wide range in the model forecasts for the storm’s future track. This makes identifying a “most likely” track all the more challenging. Note the tremendous divergence of possibilities, including several models that hook this storm toward the left (west), with potential landfall anywhere from the Outer Banks to Boston. The NHC OFCL track is in the middle of the guidance. The intensity forecast remains equally problematic. The guidance spread is shown above, which shows the official NHC OFCL intensity remains conservative at 70 mph as the storm comes within striking range of the Mid-Atlantic coastline. But a sizable number of models do intensify this storm into a Category 1 or 2 hurricane, which the National Hurricane Center notes in their discussion. The rationale for strengthening is the potential for wind shear over the storm to decrease. 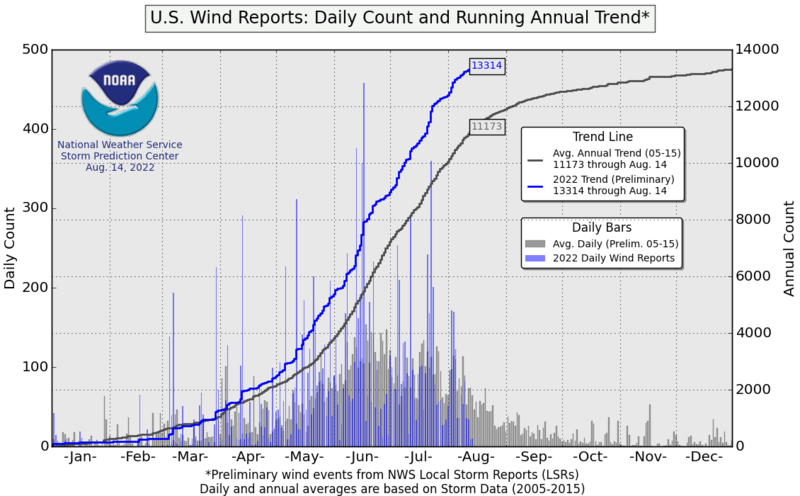 Wind shear is detrimental to tropical cyclones, and if it weakens it could allow the storm to strengthen to its full potential over the warm waters which are currently at the warmest levels ever measured since weather records began in 1880. Regardless of the forecast model of the day. The situation is ugly with a similar set up that brought Hurricane Sandy up the East Coast of the U.S in the fall of 2012 which leads me to think the probability of Joaquin impacting the East Coast of the U.S. is higher than the storm tracking out to sea. I also feel the NHC is too conservative on intensity and the NHC should adjust this upward over the next few days. Even if Joaquin doesn’t make landfall as a hurricane or tropical storm, this meteorological setup is nearly ideal for a high-impact flood event later this week across the core of the Northeast and Mid-Atlantic. Comparing the current pattern with similar historical weather patterns, one of the leading analogs right now is Hurricane Irene in 2011, which produced catastrophic flooding in upstate New York and New England. Other matches include the merging of Tropical Storm Tammy and a subtropical depression in October 2005 and the remnants of Tropical Storm Nicole in 2010. Therefore the rainfall of the 10” – 12” in parts of East Coast states will lead to some of the worst flooding not seen in several years. Again, there is significant uncertainty in the forecast for this storm, and we will probably continue to see the models toss and turn over the next 24 to 48 hours. Big swings in track and intensity are possible. Social media is abuzz with discussion of a big East Coast hit, but any serious discussion should be tempered at this point concerning specific model solutions. This is something to watch and monitor closely for the rest of this week as this complex forecast situation resolves. Tropical Storm Erika continues to defy forecasts made earlier in the week. At this point in time Erika was supposed to be much further north of the island of Hispaniola and in a much better overall environment for intensification. However, Erika is currently 90 miles southeast of Santo Domingo, DominicaRepublic, in an environment that is not at all conductive to tropical cyclone development. This further westward movement calls for drastic changes to the probabilities forecast options provided in my last update as we play another round of model roulette. In the last update I highlighted the overall uncertainties in tropical cyclone forecasting, and Erika has definitely met expectations with regard to those uncertainties. Tropical Storm Erika continues to battle an incredibly unfavorable environment. The wind shear, which acts to tear apart tropical cyclones, is already quite strong – about 20 mph from the west – and it is forecast to increase to nearly 30 mph today. That amount of shear is hard for a well-developed storm to fend off, and Erika isn’t even well developed , which increases the overall probability of dissipation. Erika is in a area of 20 kts shear and is moving into an areas where shear could be as high as 30 kts. Tropical storms / hurricanes don’t like areas of high shear. If Erika manages to make it over the mountains of Hispaniola intact and fight of this high shear area, she could quickly intensify again in the extremely warm waters off the coast of Florida. In fact history would suggest a tropical storm tracking up the west coast of Florida could be quite destructive such as the 1935 Labor Day hurricane. Stalled hurricane in the Bahamas (0% chance) – Unlike the last update, this is now the least likely option for Erika, given its westward track. Hurricane landfall in south Florida (30% chance) – A category 1 hurricane near south Florida on Monday morning with the storm stalling over the state of Florida during the middle of next week. This would caused 6-8” or rain to fall over much of the state. Tropical storm landfall in south Florida, but a hurricane on the Florida panhandle (35% chance) – Maintain a west-northwest heading, gradually intensifying and heading for south Florida as a tropical storm. Then tracking into the western Gulf of Mexico and becoming a hurricane along the west coast of Florida and into the Florida panhandle. Death in the Caribbean (35% chance) – Failure to reach the mainland U.S.; and the storm stays further south and tracks over Hispaniola, Cuba, and maybe even northern Jamaica. Once again there are forecast uncertainties and one can’t rule out Erika playing more forecasting tricks over the weekend as this weak disorganized system tries to stay alive. Hispaniola is historically a tropical cyclone blender. If the NHC forecast is correct with a tropical storm landfall or close encounter to Florida much of the state may well be affected by the storm’s rainfall. The last tropical cyclone to make landfall on south Florida was tropical storm Bonnie on July 23, 2010. Before that, the previous one was tropical storm Ernesto on August 30, 2006. 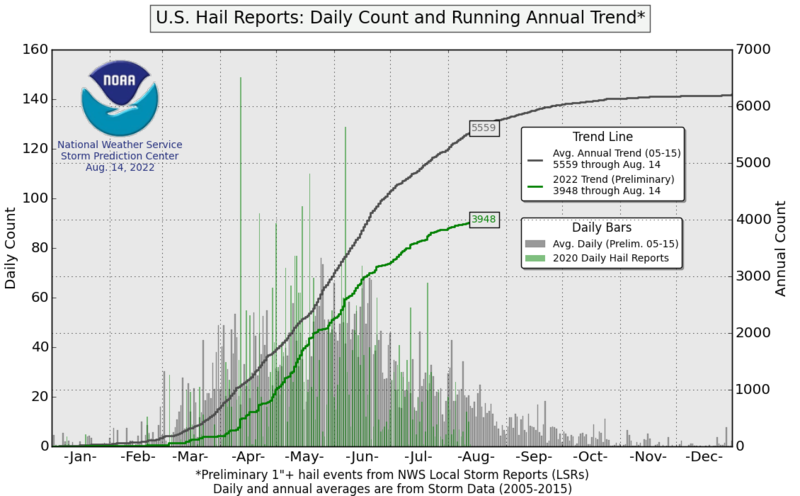 So indeed named storm activity has been very sparse since the wild 2004 and 2005 seasons. Remember that tropical storms are still quite capable of causing flash floods and power outages, as well as coastal erosion and flooding, and the winds can throw around unsecured loose objects. Tropical cyclones can also cause insured loss, case in point tropical storm Bill impacting Texas earlier this June. Looking ahead there are no other tropical systems that should develop in the Atlantic Ocean next week. Since my last update on Monday at noon, Erika has formed into a tropical storm and is tracking toward the Bahamas. Erika is currently 285 miles east of the island of Antigua in the western Caribbean. Tropical storm watches and warnings are out for many of the northern Caribbean islands. However, the headliner is that for the first time in three years, Florida is under the National Hurricane Center’s (NHC) forecast track cone of uncertainty. With a Florida landfall probability of 30%, there is a very real possibility that the 10-year Florida landfalling hurricane drought could end. However, I must remind all readers about the overall uncertainties with forecasting hurricanes more than five days in advance. The uncertainty exists for a few reasons. First, the NHC track forecast errors over the past five years are 180 miles at day 4 and 240 miles at day 5, which are represented in the NHC cone of uncertainty. Secondly, intensity errors can also be large. Finally, this season is an El Niño year, which seem to be notorious for major hurricanes that start late in their careers. Betsy in 1965, Alicia in 1972, and Andrew in 1992 all took time to develop, but each El Niño year resulted in a major hurricane. To demonstrate how a forecast can change look at what happen 10 years ago today as Katrina was moving off the Coast of Florida. In the loop below you will notice how the NHC forecast cone of uncertainty on Auguest 26th 11 am 2005 change in just a 12 hour period. This pivotal shift in Katrina’s forecast track occurred on Aug 26, 2005 moving from a FL panhandle landfall to LA/MS. It should also be noted drastic forecast improvements of 40% have been made to hurricane track since 2005 which is show in the following plot of Katrina than and what it would be now. The forecast models for Erika are currently all over the place. Many meteorologist and various media outlets may continue to play model roulette, but the fact remains that Erika’s forecasted track and intensity is uncertain. Further, as I highlighted on Monday, we have to consider Erika’s overall weather pattern in light of the fact that the peak of the hurricane season is just 15 days away. Forecasters need to consider El Nino characteristics which include tropical waves and storms that may struggle in the main development region of the Atlantic Ocean. But as these storm move closer to the U.S. coastline, they will be more likely to develop and strengthen. These factors can’t be seen in any one forecast model run. The vertical wind shear, which can tear storms apart, is not very strong. However, until Friday, wind shear will continue to limit development. So if Erika can survive wind shear this week, as discussed in Monday’s write up, the change in the weather systems will cause shear to decrease as Erika tracks closer to the U.S.
Less environmental dry air is getting wrapped into the circulation, which can disrupt thunderstorm development. The ocean temperatures below the storm are becoming increasingly warm. The ocean heat content is increasing along the storm’s forecast track. Death in the Caribbean (5% chance) – Failure to reach the mainland U.S.; storm stays further south and tracks over Puerto Rico, Hispaniola. But it’s looking less likely at this point. Weak tropical storm landfall in the Florida panhandle (15% chance) – Maintain a west-northwest heading, avoiding the Greater Antilles, and gradually intensifying and heading for south Florida as a tropical storm (then tracking into the Gulf of Mexico and becoming a hurricane along the west coast of Florida). Hurricane landfall in south Florida (30% chance) – A Category 1 or 2 hurricane near south Florida on Monday (as suggested by the historically accurate European model (ECMWF), along with the high-resolution U.S. Hurricane Weather Research and Forecasting (HWRF) model). The HWRF model has been especially insistent on this. Stalled hurricane (50%) chance. – Maybe at this time, the most likely scenario would be a hurricane tracking over the Bahamas near Florida where it will get trapped by weak atmospheric steering currents for a few days. It is important to note “impacts” of hurricane can occur many hundreds miles away from the cone of uncertainty: rain, storm surge, and strong winds could certainly occur outside of this cone. In the next post I can start to focus in on the insured impacts. In addition to frequent flights into Erika by hurricane hunters, a NASA Global Hawk drone was scheduled to embark on a 24-hour mission in and around the storm on Wednesday.